An Egg Rounder in Tropical Jungle. Egg Rounders are combat automatons constructed by Dr. Ivo "Eggman" Robotnik, deployed by the mad scientist in and around Soleanna during Sonic the Hedgehog (2006). It's a short and bulky robot with two arms, which moves either in straight or circle trajectories and are always clustered in packs. 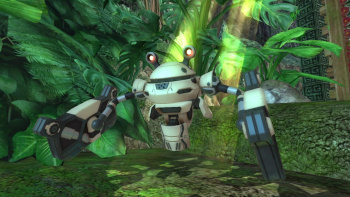 The Egg Rounder can use the arms to tackle its enemies and it has defense plates which it can put up to deflect attacks. It has poor armor, taking one hit to destroy. It has an advanced model, the Egg Commander and they are rarely seen without one. The Egg Commander always acts as a leader to the Egg Rounders, so one the former is destroyed, all the Egg Rounders on screen are destroyed as well.